We’d love your help. 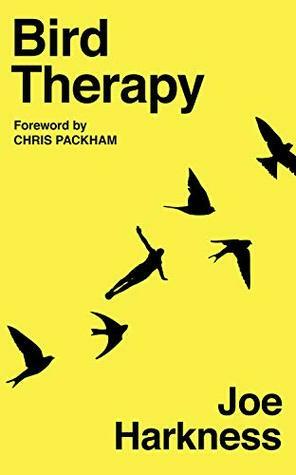 Let us know what’s wrong with this preview of Bird Therapy by Joe Harkness. When Joe Harkness suffered a breakdown in 2013, he tried all the things his doctor recommended: medication helped, counselling was enlightening, and mindfulness grounded him. But nothing came close to nature, particularly birds. How had he never noticed such beauty before? Soon, every avian encounter took him one step closer to accepting who he is. The positive change in Jo When Joe Harkness suffered a breakdown in 2013, he tried all the things his doctor recommended: medication helped, counselling was enlightening, and mindfulness grounded him. But nothing came close to nature, particularly birds. How had he never noticed such beauty before? Soon, every avian encounter took him one step closer to accepting who he is. The positive change in Joe's wellbeing was so profound that he started a blog to record his experience. Three years later he has become a spokesperson for the benefits of birdwatching, spreading the word everywhere from Radio 4 to Downing Street. To ask other readers questions about Bird Therapy, please sign up. Uplifting, honest, funny and vulnerable - a brilliant book for anyone looking to fight off the anxiety of modern life through a closer connection to nature. Joe’s book is incredibly heartfelt and genuine - I felt his pains and joys throughout and couldn’t wait to get outside after I finished it. Love nature, guys - it’s one of the only reliable forms of contentment!